A bus, be it a coach, minibus or charter bus, is an efficient and effective way to move people across the country and there are thousands of buses on Australian roads at any given time. However, when the bus itself needs to be transported, this can become a great logistical challenge. There are a number of reasons why buses are relocated across Australia, both interstate and within metropolitan areas. These include break downs, unroadworthy or undriveable vehicles, or interstate purchases that need relocating to their new destination. Finding a reliable and reputable bus transport company with experience in moving heavy vehicles long and short distances is absolutely essential. Get quotes to move a bus, coach or minibus today! Get 3 Quotes for heavy vehicle shipping. It’s free to request quotes. What types of buses are transported? Bus: If a bus is purchased at auction, it often doesn’t run, is undriveable or it is currently unroadworthy. In this instance, it’s essential to enlist the services of a heavy vehicle transport company to ensure you can get the bus safely to its destination. You will require a bus transport company with experience in carrying bus freight who is reliable and trustworthy to handle your bus cargo. Double Decker Bus: When it comes to having a double decker bus relocated, the major aspect to consider when selecting a bus transport company to use is the height of the bus. This will impact what type of trailer is required to haul the bus. In most instances, with double decker buses a heavy vehicle transport company with a drop deck trailer or low loader will be required to accommodate for the extreme height of the heavy vehicle. Coach: The length of the coach is extremely important as this will determine which type of truck and trailer is required to haul the coach. At a minimum, a bus transport company with a semi-trailer is going to be needed in the case of coach relocation. When requesting costs for bus transport, it’s important to include the length of the bus so that you are receiving transportation quotations from truckies with the correct trailers to handle the length of your coach. Mini Bus: Mini buses most commonly require bus transport when a purchase has been made interstate, when a breakdown has occurred or when the mini bus is unroadworthy or undriveable. Mini buses are able to be towed behind a truck or trailer by a bus transporter and this option often means that you will be more likely to find a bus transport company faster. Charter Bus: A charter bus is a large heavy vehicle that is used to charter travellers across Australia, both interstate and intrastate. If the charter bus is undriveable but the tyres are in good condition, then the bus can be winched by a heavy vehicle transport company onto the back of a tilt tray flatbed semi-trailer. If the heavy vehicle is driveable, this creates an easier situation as the bus can then be driven onto the tilt tray trailer for the bus transport company. School Bus: For purchases and breakdowns, school buses are sometimes required to be hauled from one location to another by a professional heavy vehicle transport company and this can be regionally or even locally around metropolitan areas across Australia. Finding a dependable and reputable bus transport company to haul your school bus freight is extremely important as these heavy vehicles require a level of expertise to shift. 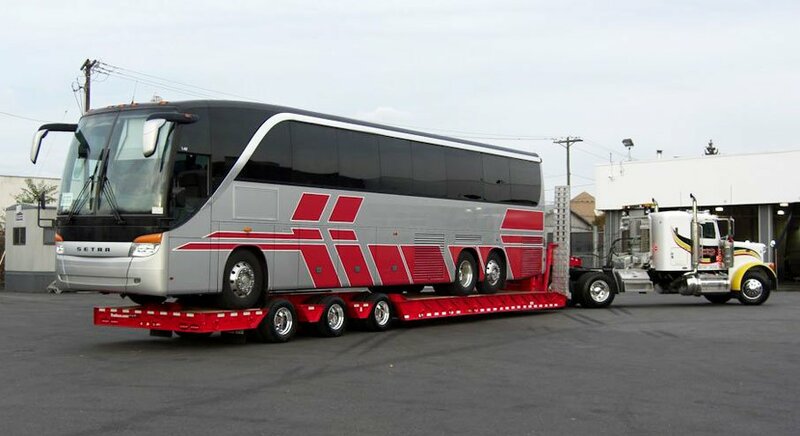 Bus Body: If the bus body that you need to have hauled has the wheels attached then loading and unloading the body for the bus transport company is relatively similar to when a complete bus is loaded. However, as the bus body is undriveable, this would need to be winched and loaded onto a tilt tray or with loading ramps by the heavy vehicle transporter. If the body is without wheels, then this becomes heavy haulage and you may need to seek alternative options to get the bus body on the back of the truck. Bus Chassis: A bus chassis can be extremely long freight, as it is going to be upwards of the length of a large, double decker or charter bus. Therefore, a bus transport company with a semi-trailer may still be required in order to accommodate the length of the bus chassis. As the height is not an issue because it is just the bus’s chassis, there are no concerns with a heavy vehicle transporter having to have a drop deck trailer. As the chassis still has the wheels attached, it is easy enough to winch up loading ramps or onto a tilt tray trailer by the truckie. Heavy vehicle transport can come with many challenges. Therefore, it’s even more important to find a bus transport company who is experienced with bus freight for your bus, coach or charter bus. FreightQuotes is able to help you find the right heavy vehicle transporter for your particular needs and will connect you with businesses who are equipped with the right vehicle and equipment to transfer your bus interstate or locally. Simply submit a free quote request through the get quotes form and your request will be sent to all the bus transport companies registered with the FreightQuotes website. You’ll then have three suitable bus transport companies contact you with costs and rates for your personal bus haulage needs. It’s simple, easy and convenient. Heavy vehicle transport is available Australia wide. This includes interstate, regional and metropolitan bus freight covering all states and capital cities including Adelaide, Brisbane, Perth, Darwin, Melbourne, Canberra, Hobart and Sydney.